For other uses, see Car bomb (disambiguation). The result of a car bombing in Iraq. A car bomb, or truck bomb, also known as a vehicle-borne improvised explosive device (VBIED), is an improvised explosive device placed inside a car or other vehicle and detonated. It is commonly used as a weapon of assassination, terrorism or guerrilla warfare, to kill the occupants of the vehicle, people near the blast site, or to damage buildings or other property. Car bombs act as their own delivery mechanisms and can carry a relatively large amount of explosives without attracting suspicion; in larger vehicles and trucks, weights of at least 7,000 pounds (3,200 kg) have been used, for example, in the Oklahoma City bombing. Car bombs are activated in a variety of ways; including opening the vehicle's doors, starting the engine, depressing the accelerator or brake pedals or simply lighting a fuse or setting a timing device. The gasoline in the vehicle's fuel tank may make the explosion of the bomb more powerful by dispersing and igniting the fuel. Car bombs are effective weapons as they are an easy way to transport a large amount of explosives to the intended target. A car bomb also produces copious shrapnel, or flying debris, and secondary damage to bystanders and buildings. In recent years, car bombs have become widely used by suicide bombers. Provisional Irish Republican Army (PIRA) Chief of Staff Seán Mac Stíofáin defines the car bomb as both a tactical and a strategic guerrilla weapon. Strategically, it disrupts the ability of the enemy government to administer the country, and hits simultaneously at the core of its economic structure by means of massive destruction. From a tactical point of view, it ties down a large number of security forces and troops around the main urban areas of the region in conflict. Defending against a car bomb involves keeping vehicles at a distance from vulnerable targets by using roadblocks and checkpoints, Jersey barriers, concrete blocks or bollards, metal barriers, or by hardening buildings to withstand an explosion. Since the height of the Provisional Irish Republican Army (PIRA) campaign, the entrance to Downing Street has been closed, preventing the general public from getting near Number 10. Where major public roads pass near buildings, road closures may be the only option (thus, for instance, in Washington, D.C. the portion of Pennsylvania Avenue immediately in front of the White House is closed to traffic). Historically these tactics have encouraged potential bombers to target "soft" or unprotected targets, such as markets. Car bombs and detonators function in a diverse manner of ways and there are numerous variables in the operation and placement of the bomb within the vehicle. Earlier and less advanced car bombs were often wired to the car's ignition system, but this practice is now considered more laborious and less effective than other more recent methods, as it required a greater amount of work for a system that could often be quite easily defused. While it is more common nowadays for car bombs to be fixed magnetically to the underside of the car, underneath the passenger/driver's seat, or inside of the mudguard, detonators triggered by the opening of the vehicle door or by pressure applied to the brakes or accelerating pedals are also used. Bombs operating by the former method of fixation to the underside of the car more often than not make use of a device called a tilt fuse. A small tube designed of glass or plastic, the tilt fuse is not dissimilar to a mercury switch or medical tablet tube. One end of the fuse will be filled with mercury, while the other open end is wired with the ends of an open circuit to an electrical firing system. Naturally, when the tilt fuse moves or is jerked, the supply of mercury will flow to the top of the tube and close the circuit. Thus, as the vehicle goes through the regular bumping and dipping that comes with driving over a terrain, the circuit is completed and the bomb or explosive is allowed to function. As a safety mechanism to protect the bomber, the placer of the bomb may rig a timing device incorporated with the circuit to activate the circuit only after a certain time period, therefore ensuring the bomber will not accidentally activate the bomb before he or she is able to get clear of the blast radius. While many car bombs are disguised as ordinary vehicles,some that are used against military forces have Improvised vehicle armour attached to prevent the driver from being shot when attacking a fortified outpost. Car bombs can be seen as the remote descendants of the 16th century hellburners, explosive-loaded ships which were used to deadly effect by the besieged Dutch forces in Antwerp against the besieging Spanish. Though using a less refined technology, the basic principle of the hellburner is similar to that of the car bomb. Prior to the 20th century, bombs planted in horse carts had been used in assassination plots, notably in the unsuccessful "machine infernale" attempt to kill Napoleon on 24 December 1800. The first car bomb may have been the one used for the assassination attempt on Ottoman Sultan Abdul Hamid II in 1905 in Istanbul by Armenian separatists, in the command of Papken Siuni belonging to the Armenian Revolutionary Federation. The first possible suicide car bombing (and possibly the first suicide bombing) was the Bath School bombings of 1927, where 45, including the bomber, were killed and half of a school was blown up. 1920: The Wall Street bombing — Suspected that Italian anarchist Mario Buda (a member of the "Galleanists") parked a horse-drawn wagon filled with explosives and shrapnel in the Financial District of New York City. 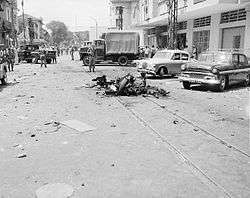 The blast killed 38 and wounded 143. 1927: The Bath School disaster — Andrew Kehoe used a detonator to ignite dynamite and hundreds of pounds of pyrotol which he had secretly planted inside a school. As rescuers started gathering at the school, Kehoe drove up, stopped, and detonated a bomb inside his shrapnel-filled vehicle, killing himself and the school superintendent, and killing and injuring several others. In total, Kehoe killed 44 people and injured 58 making the Bath School bombing the deadliest act of mass murder in a school in U.S. history. It is possibly the first suicide car bombing in history. Militant group Lehi were the first group to use car bombs in the British Mandate for Palestine. The Viet Cong guerrillas used them at the end of the First Indochina War and throughout the Vietnam War. The OAS used them at the end of the French rule in Algeria. The Sicilian Mafia used them to assassinate independent magistrates up to the early 1990s. The IRA used them frequently during its campaign during the Troubles in Northern Ireland and England. The Omagh bombing by the Real IRA, an IRA splinter group, caused the most casualties in the Troubles from a single car bomb. Loyalist organisations in Northern Ireland such as the Ulster Volunteer Force (UVF) and Ulster Defence Association used car bombs against civilians in both Northern Ireland and the Republic of Ireland. The UVF bombs in Dublin and Monaghan caused the most casualties in a single day during the Troubles. The Basque separatist group Euskadi Ta Askatasuna (ETA) carried out at least 80 massive car bomb attacks in Spain during the last decade before putting its activities on hold in 2011. Freelance terrorist Carlos the Jackal claimed responsibility for three car bomb attacks on French newspapers accused of pro-Israeli bias during the 1970s. Cleveland Irish mobster Danny Greene frequently used car bombs against his enemies, beginning in 1968. Afterwards, they also began to be used against Greene and his associates. The use of car bombs in Cleveland peaked in 1976, when 36 bombs exploded in the city, most of them car bombs, causing it to be nicknamed "Bomb City." Several people, including innocent bystanders, were killed or wounded. Greene himself was finally killed in a car bomb explosion on October 6, 1977. The German Red Army Faction occasionally used car bombs, such as in an unsuccessful attempt to attack a NATO school for officers in 1984. On 23 November 1986 two members of the Armenian Revolutionary Federation carried out the Melbourne Turkish consulate bombing using a car bomb, which resulted in the death of one of the attackers. During the Soviet–Afghan War, at a variety of training camps in the tribal areas of Pakistan, the Pakistani ISI, with the aid of the CIA, trained mujahideen in the preparation of car bombs. Car bombs became a regular occurrence during the war, the Afghan civil conflicts which followed, and then during the U.S. invasion of Afghanistan. Agents of the Chilean intelligence agency DINA were convicted of using car bombs to assassinate Orlando Letelier and Carlos Prats, who were opponents of the regime of Augusto Pinochet. Letelier was killed in Washington, DC. In the 1980s, the Colombian drug lord Pablo Escobar used vehicle bombs extensively against government forces and population centers in Colombia and Latin America. The most notable car bombing attack was the DAS Building bombing, which killed 52 and injured about 1,000. Suicide car bombs were a regular feature against Israel in the 1982 Lebanon War which lasted from 1982 until Israel's withdrawal in 2000. The bombing campaign was waged by several groups, most prominently Hezbollah. On 26 February 1993, Islamist terrorists led by Ramzi Yousef detonated a Ryder truck filled with explosives in the parking garage of the World Trade Center in New York City. Yousef's plan had been to cause one of the towers to collapse into the other, destroying both and killing thousands of people. Although this was not achieved, six people were killed, 1,402 others injured, and extensive damage was caused. On 19 April 1995, Timothy McVeigh detonated a Ryder box truck filled with an explosive mixture of ammonium nitrate fertilizer and fuel oil (ANFO) in front of the Alfred P. Murrah Federal Building in Oklahoma City during the Oklahoma City bombing, killing 168 people, including 19 children who were in the daycare. In the late 1990s and early 2000s, vehicular explosives were used by Chechen nationalists against targets in Russia. On 20 April 1999, Eric Harris and Dylan Klebold planned to use two car bombs as the last act of the Columbine High School massacre, apparently to murder police and first responders. Both car bombs failed to explode, though Klebold's detonated at 11 PM instead of 11 AM as planned, but no one was injured. Southeast Asia-based militant Islamist group Jemaah Islamiyah utilized car bombs in their campaigns during the early 2000s, the most prominent being the 2002 Bali bombings, which killed 202 people. On 30 June 2007, a Jeep Cherokee loaded with propane tanks crashed into the entrance of Glasgow International Airport. The vehicle caught fire, but failed to detonate. As a result, there were no injuries from the attack itself apart from the driver, who died of his injuries several weeks later, and one passenger who was severely burned, although several bystanders were injured in restraining the two. The attackers appear to have been Muslims unaffiliated with any organization who were disgruntled about the War on Terror. Thirty-six hours earlier, two bombs had also been found in a vehicle in London, although the police reported that the bombs were incomplete and could not have exploded. The Tamil Tigers of Sri Lanka frequently made use of car bombs during that country's civil war in a campaign which lasted from 1976 until the group's defeat in 2009. A car bomb which had misfired was discovered in Times Square, New York City on May 1, 2010. The bomb had been planted by Faisal Shahzad. Evidence suggests that the bombing was planned by the Pakistani Taliban. On 11 December 2010, a car bomb exploded in central Stockholm in Sweden, slightly injuring two bystanders. Twelve minutes later, a Swedish man of Iraqi origin accidentally detonated six pipe bombs he was carrying, but only one exploded. The bomber was killed but there were no other casualties. It is believed that the attacks were the work of homegrown terrorists who were protesting Sweden's involvement in the war in Afghanistan and the publication in Sweden of cartoons depicting Muhammad. On 22 July 2011, in the Norway massacre, far-right extremist Anders Behring Breivik detonated a car bomb within the executive government quarter of Oslo, Norway, killing 8 people. Mass-casualty car bombing, and especially suicide car bombing, is currently a predominantly Middle Eastern phenomenon. The tactic was first introduced to the region by the Stern Gang, who used it extensively against Palestinian and British military targets; it was subsequently taken up by Palestinian bombers as well. The tactic was widely used in the Lebanese Civil War by the Islamic fundamentalist group Hezbollah. A notable suicide car bombing was the 1983 Beirut barracks bombing, when two simultaneous attacks killed 241 U.S. Marines and 58 French military personnel. The perpetrator of these attacks has never been positively confirmed. In the Lebanese Civil War, an estimated 3,641 car bombs were detonated. Various Palestinian militant groups, against both military and civilian Israeli targets. Many Lebanese militants continue to use car bombs against domestic opponents, a notable example being the assassination of Rafic Hariri, the country's former Prime Minister, on 14 February 2005. Hezbollah member Imad Mughniyah was assassinated by a car bomb in Syria in 2008, allegedly by Mossad. Although it has never been officially acknowledged, the American CIA has occasionally been accused of being behind car bombings. One such attack was the failed assassination attempt on Grand Ayatollah Mohammad Hussein Fadlallah in the Beirut car bombing on 8 March 1985. Although there has been widespread speculation of CIA involvement, this has never been proven conclusively. Dissident republicans in Northern Ireland used car bombs in the last two decades, the deadliest attack being the Omagh bombing of 1998. Al-Qaeda, in attacks around the world since the 1990s, most notably the 1998 United States embassy bombings. Militants and criminals in India occasionally utilize car bombs in attacks. This includes Muslim, Sikh, Kashmiri and Naxalite militants, as well as rival politicians within the government and organized crime. A notable recent attack was the 25 August 2003 Mumbai bombings, in which two car bombs killed 54 people. The attack was claimed by the Pakistani-backed Kashmiri separatist group Lashkar-e-Taiba. Since the beginning of the U.S.-led war in Afghanistan in 2001, the Taliban have often employed vehicular explosives against enemy targets. This has included not just cars and trucks but even bicycle bombs. 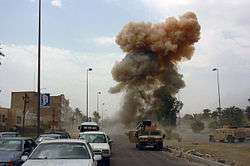 A 2005 car bombing in Iraq, in which a second car bomb was detonated while US forces were investigating the scene of an earlier such blast, resulting in 18 casualties. The Iraqi insurgency - an estimated 578 car bombs were detonated in Iraq between June 2003 and June 2006. Car bombs continue to be commonly used. The Pakistani Taliban have occasionally used car bombs in their ongoing conflict with the government of Pakistan. The Juárez Cartel's armed wing, La Línea, used a car bomb to attack police officers in Ciudad Juárez, Mexico on 15 July 2010. The Sinaloa Cartel and the Gulf Cartel were blamed for using car bombs in Nuevo Laredo, Mexico on 24 April 2011 to "heat up" the turf of Los Zetas. 1 2 "Vehicle Borne IEDs (VBIEDs)". Global Security. Retrieved 3 August 2008. 1 2 3 4 Wilkinson, Paul; Christop Harman (1993). Technology and terrorism. Routledge. ISBN 0-7146-4552-4. ↑ McStiofáin, Seán (1975). Revolutionary in Ireland. G. Cremonesi. p. 243. ↑ "Take a look inside an armoured Islamic State car bomb". ABC News. ↑ Car bomb kills Northern Ireland lawyer BBC News, 15 March 1999. ↑ Taylor, Peter (1999). Loyalists. Bloomsbury Publishing. pp. 125–126. ISBN 0-7475-4519-7. ↑ Davis, ch. 13, "Car-Bomb University"
↑ Davis, chapter 4, "Oranges for Jaffa". ↑ "200lb of explosives in Derry car bomb". BBC News. ↑ Daniel Swift (4 May 2007). "Explosive reading". Review of: Buda’s Wagon: A Brief History of the Car Bomb. Financial Times. Retrieved 6 May 2010. ↑ Ellingwood, Ken (21 October 2010). "Mexico arrests man alleged to have directed fatal Juarez car bomb attack". Los Angeles Times. Retrieved 6 May 2012. ↑ "Car bomb explosion followed by shootout in Nuevo Laredo". KGBT-TV. 24 April 2012. Retrieved 6 May 2012. ↑ "Reafirma El Chapo presencia en Tamaulipas con coche bomba". Blog del Narco (in Spanish). 24 April 2012. Retrieved 6 May 2012. ↑ "Suman 23 ejecutados en Nuevo Laredo, entre decapitados y colgados". Proceso (in Spanish). 4 May 2012. Retrieved 6 May 2012. Mike Davis, Buda's Wagon: A Brief History of the Car Bomb (Verso: New York, 2007). Wikimedia Commons has media related to Car bombs.